How SCI Enables Aircraft Crews - SCI Technology, Inc. The AH-64E is a combat weapons system that provides reaction time and maneuver space to Ground Force Commanders, enabling them to impose their will on the enemy throughout the battle space. A team of AH-64E Apaches can ultimately be the crucial difference whether our forces can seize, retain, or exploit the initiative. The photo above clearly highlights the awesome vantage point that the platform provides for the crew as they provide reaction time and maneuver space to combatant commanders. However, the extremely complex human-to-machine interaction and workload taking place within the cockpit is often overlooked. What’s not clear is how the crew interacts with this aircraft to get to that vantage point. As the missions of the AH-64E become more diverse and technology becomes more complex, especially with the advent of Manned-Unmanned Teaming (MUM-T), we often fail to consider how the link between the human and the machine will affect the mission. These combat aviators rely almost completely on a visual interface. Combat systems developers have ignored leveraging the other human senses that can further empower the pilot and increase the operational effectiveness of the aircraft. The three dimensional audio provided by SCI Technology’s FireComm® digital intercommunications system (ICS) can allow each aviator to monitor and respond to multiple radios simultaneously, to instinctually react to threat weapons systems, and to increase their reaction time during emergency operations. Furthermore, the Voice Command Interface feature of FireComm allows the aviator to use voice commands to directly manage the aircraft systems. 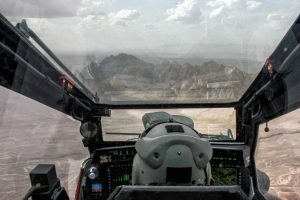 This added voice capability allows aviators to keep his/her focus outside the aircraft and their hands directly on the flight controls instead of transitioning their attention inside the aircraft to manipulate a multi-function display (MFD). Implementation of added aural and audio technological capabilities will further enable AH-64E aircrews to continue to conduct air-ground operations (AGO) in support of ground force commanders.